Most of us think that litter pans are all the same, but the reality is that they are absolutely not! Despite how similar some pans can seem at first glance, each of them functions a little bit differently. These small difference can add up to big differences for both you and your cat, so you should take the time needed to ensure that the litter pan will work for you both. Will the Catit Cat Litter Pan be right for your home? Let’s find out. The best part about the Catit Cat Litter Pan (and why most people choose it) is the angled rim around the edge of the litter pan. This ridge helps to prevent litter from going everywhere around the box, even if you have a digger! Despite litter often getting flung around while cats prepare to do their business, this box prevents much of that excess litter from reaching the floor. This litter box is for cat owners who want to stick to the simplicity of a standard litter box while also dealing with less of the mess. The included rim make this litter box a bit neat while still being just as easy to use as ever before. This litter box comes with the litter box, which has a snap-on rim. This box has a detachable rim. While not absolutely necessary, the rim makes it convenient to easily remove litter from the box, and you can also detach it so that you can secure liners or paper in the bottom of the box for easier cleanup. The footprint of this pan is very good. It’s not so big that kittens will get lost in it, and it’s not too small for even 20-pound cats! Most cats will find it to be a good size for easy use, and they have enough space to turn around and find a good spot to go, and that is essential in a good kitty litter box. While the litter box is fairly sturdy, it is made of a very lightweight material that can end up cracking if it is used without proper care. While this is unlikely, it is worth mentioning for those who know that their cats or other pets are likely to push the litter pan around, as this action could cause additional damage. Finally, the height of this pan is great for cats of all ages. Even if you have an older cat that cannot jump or climb as well as they used to, they will not have a problem getting into this pan since it has an angled design. The walls are high enough to prevent spillage while still being low enough as to be convenient for your cat. Using an open litter pan like the Catit Cat Litter Pan can be worrying for some owners who like clean, fresh-smelling homes. While you may worry that an open pan will lead to messes and smells, using this pan properly will prevent both of those things! First, try using this litter pan with liners. Cat liners that catch excess urine and other liquids are a key part of preventing smells from building up. Thanks to the detachable rim on this pan, you can easily secure liners to the bottom of the pan before filling it up with litter. With liners and a good litter, you won’t notice any smell. Second, simply use this pan with the rim to prevent litter from getting around your house. The high sides will prevent any movements from causing litter to fall out of the pan. If you are really worried about any tracking, use a small litter mat in front of the pan for best results. Some people may find that their cat might like a bit more privacy while going to the bathroom due to other cats or pets in the house. In this situation, cat owners will find that IRIS Cat Litter Box with Scoop has a similar base design but also includes a hooded cover. This hooded cover adds some privacy for your cat, so they can feel safe while they go. This safety factor can help prevent more accidents while also giving your cat a more stress-free experience at home. So if you feel like your cat will prefer to have a hiding spot and a bathroom all in one, this might be the better option for your family. The Catit Cat Litter Pan with Rim is the perfect solution pan for owners who are tired of their kittens or cats kicking litter out the side of their boxes every day. Even if it is only a small amount of litter, it can be annoying to have to sweep it up every day. 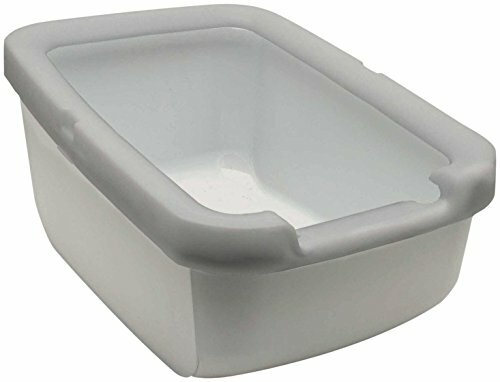 This high-rimmed litter box prevents this type of mess, and it also makes it possible to secure liners to the bottom of the litter box without needing tape or any other adhesive. This litter box was built to prevent any mess!